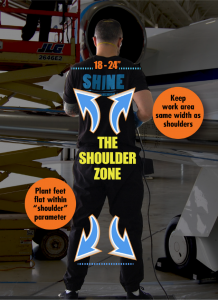 Polishing metal surfaces involves maintaining the correct body stance. Plant feet, lined directly under your shoulders, firmly on a level surface. Keep work area the same width as your shoulders; approximately 18” to 24”. Apply product, as directed, ONLY within this polish area. Beginning top right or left, work back & forth, right to left within the targeted polish area. Then work same area up and down all the while applying light, but firm pressure. NEVER buff below the belt, meaning NO bending to meet lower level. Best results when you keep eye level with the polishing buffer.